A few weeks ago, we had no beans. Plenty of plants and lots of flowers, but no beans. Now we have bushel baskets full. Rattlesnake Beans, that start out as purple, then are green with purple streaks, then solid green. Very little if any strings, and delicious, barely need to be cooked. 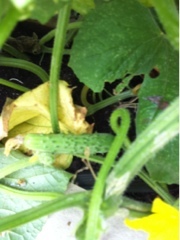 Now we have cucumber plants growing everywhere, covered with flowers, but no cucumbers yet. 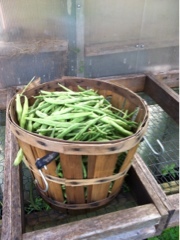 Probably next week bushel baskets full. Eggplants and peppers are still lagging behind. With a late cold spell we might have stunted them. Hundreds of plants and tiny harvests.